I return to the third floor gallery to stalk the effect of Josiah McElheny’s Walking Mirror 1 and Walking Mirror 2 on the space and the viewers. My hope is to remain unseen, to find a part of the room from which to observe without catching my own reflection in one of the mirrors, but it’s not easy. Walking Mirror 1 and Walking Mirror 2 are large, rectangular structures similar to sandwich boards, with straps that hang over the performer’s shoulders, holding the respective mirrors steady as the performer glides through the exhibition space moving around the audience. The mirrored surfaces on front and back extend up to cover the face of whoever is inside and reach down to the floor. In Walking Mirror 2, the panes of glass on each side are set against each other at an angle, for maximum coverage. It’s hard to escape their gaze. 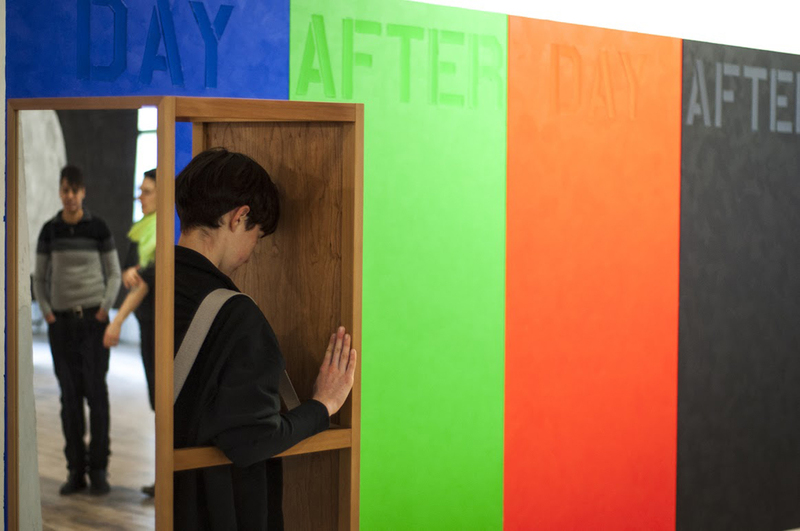 Nonetheless, I want to watch how people react to these mobile sculptures—how the reflections approach the viewers, how the viewers approach the reflections, how each person observes and is forced to negotiate his or her body in relation to their own reflection, and then move on. I’m the fly on the wall and although I attempt to be invisible it is impossible to just be a witness. Every time I look, there I am, staring back at myself. Josiah McElheny, “Walking Mirror 1,” 2012. 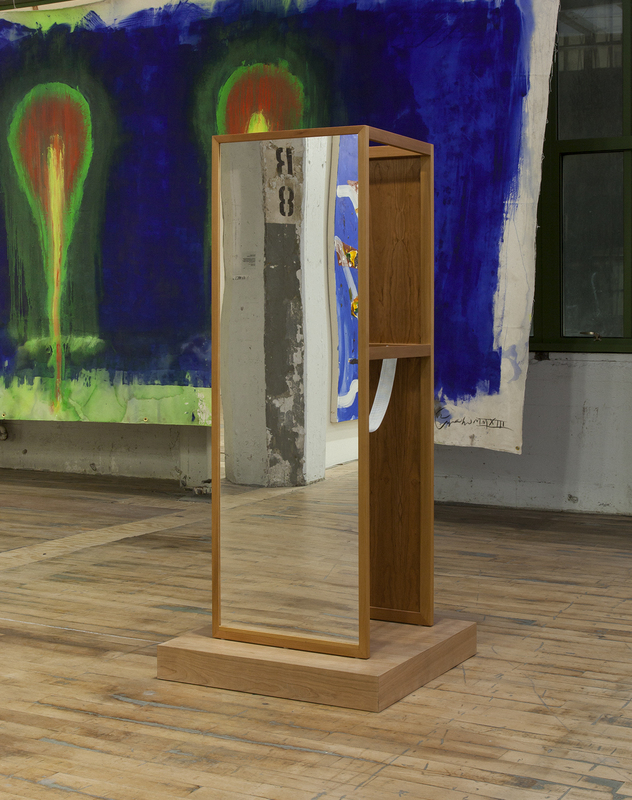 Cedar wood, mirror, cloth straps, metal hardware, wood pedestal, china marker drawing, performance instructions, periodic performance, 61 9/16 x 20 15/16 x 19 9/16″. Courtesy of the artist and Andrea Rosen Gallery. Photo by Rachel Styer. Walking Mirror 1 and Walking Mirror 2 were originally presented in a solo exhibition called Some thoughts about the abstract body at Andrea Rosen Gallery in 2012. They were part of a larger body of work in which McElheny mined the history of avant-garde fashion and costume design for abstract shapes and structures inspired by the contours of the human body. In that exhibition, the abstracted figural works were juxtaposed with McElheny’s other sculptures, hand-worked vessels resembling vases and flat silhouettes of exaggerated figures modeled after the work of various designers and artists (Delaunay, Rodchenko, McQueen, Malevich, and Courrèges, to name a few). At Surviving Sandy, these same performative works operate on their own, enacting an exposition of the very act of reflection and reflecting. Casting an image of the viewer back to whoever is looking, they remind us that crucial to this exhibition of “coming together,” is the community that has come to see it. McElheny’s pieces witness and reflect upon this coming together as they catch each viewer in the act of communal appreciation and contemplation, reflecting on reflection. Performance of “Walking Mirrors,” by Josiah McEhleny. Photo by Taylor Dafoe.